Recombinant fragment corresponding to Human Gemin 8 aa 1-124. 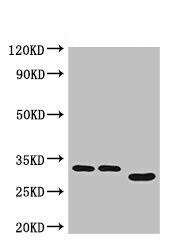 WB: HepG2 and HEK-293 whole cell lysates; Mouse kidney tissue lysate. 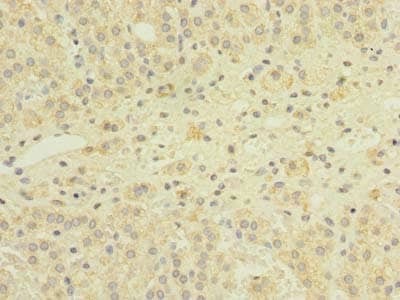 IHC-P: Human adrenal gland tissue. Our Abpromise guarantee covers the use of ab235092 in the following tested applications. WB 1/500 - 1/5000. Predicted molecular weight: 29 kDa. Gemin 8 forms a large macromolecular complex which includes other gemin proteins, SMN (survival motor neuron) protein and Unrip. This complex is required for assembly of small nuclear ribonucleoproteins (snRNPs) from Sm proteins and snRNAs. Gemin 8 mediates the binding of SMN with gemin 6 and gemin 7. Paraffin-embedded human adrenal gland tissue stained for Gemin 8 using ab235092 at 1/100 dilution in immunohistochemical analysis. ab235092 has not yet been referenced specifically in any publications. Publishing research using ab235092? Please let us know so that we can cite the reference in this datasheet. There are currently no Customer reviews or Questions for ab235092.